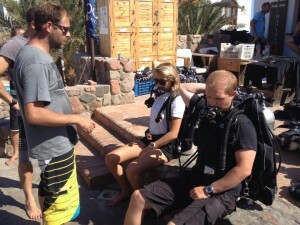 In this blog we are reviewing Tec 40 Diver, which is perhaps the most important course for any technical diver. It’s here where the student learns the principal skills they need for further training and experiences. It’s therefore crucial that the Tec/Tec Deep Instructor reviews skills like proper trim, propulsion techniques and how to be correctly weighted alongside other skills listed in Tec Diver Instructor Guide. While teaching technical diving I use a few ‘on-land workshops’ that enables the Tec 40 student to understand these concepts and prepare them better for further training. Here I introduce some of those workshops. This skill is conducted with the student sitting down while wearing the twinset fully assembled. Explain verbally at the same time as you demonstrate how, and most importantly why, you turn off the right and the left posts and the manifold. It’s important that the student understand why he/she reacts in a certain way to a specific situation to be able to react fast and correctly in the event of a leak. Start by making sure the student can reach the posts and the manifold. If they can not reach simply adjust the students equipment. When you as instructor have verified that the student can reach, then demonstrate the drill and give lots of ‘What If’ scenarios. A useful tool for this exercise is an ‘airgun’ to simulate an air leakage from one of the first stages or the manifold. Have the student to identify where the air is leaking from and then react properly to that scenario. Remember to video the students during the training dives [Note: Instructors and/or certified assistants involved in supervision should not undertake any activity that may detract from monitoring students. For more info see 4th Qtr 2005 TB. VB] The student can then watch themselves after the training dive to see how they are positioned in the water and how they execute propulsion techniques and other skills. This will help the student to better understand the areas he/she needs to improve in. If the student performed well then post some pics on Facebook and let the student tag themselves. If they did not performed so well then repeat the dive. Another tip that will prepare the student for future technical diving is to conduct all skills in a trim position facing the instructor or another student while conducting all the exercises. These simple techniques worked very well for me while teaching TecRec programs and I hope they will benefit you and you students as well. Dive well and Dive safe. Click here to find a TecRec Center close to you. Meaning of ‘Principal’. 1. first in order of importance; main. Previous PostPrevious Where have all the heroes gone?